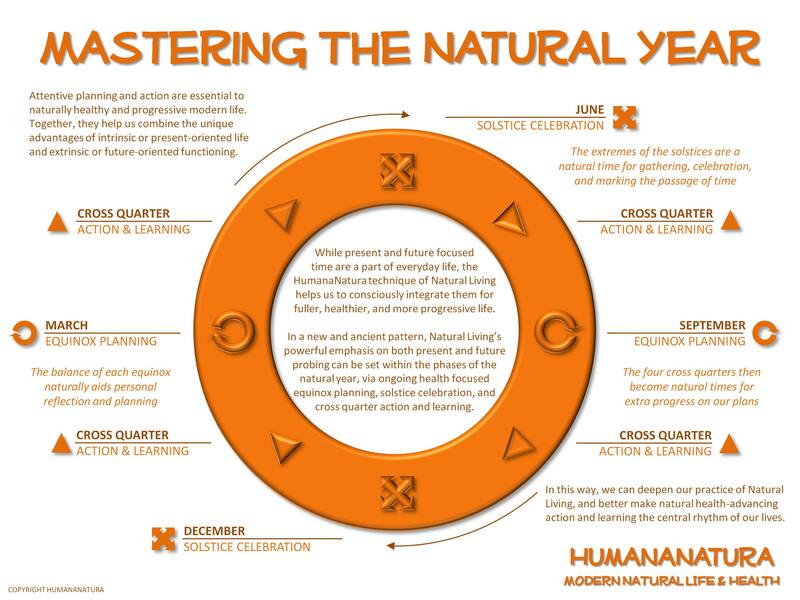 If you receive HumanaNatura’s member newsletter or follow our NaturaLife blog, you know we make regular recommendations about planning, action, and celebration during the year, or rather during the natural year. This post provides background on these recurring recommendations, for your information and to share with others. First, when HumanaNatura talks about the natural year, we mean the solar year that begins and ends with the winter solstice, or the day with the least amount of sunlight each year. As you may know, the word solstice literally means “sun-stopping” and this day – along with its complement, the summer solstice or the day with the most sunlight in the natural year – has been marked and celebrated by people at least since the beginning of recorded history. You may also know that the amount of sunlight grows and recedes during the solar year because our planet is tilted in its orbit around the sun. Because of this tilt, the earth’s two poles periodically lean into and then away from the sun as we travel around it, changing the amount of light each day, in an opposite or reciprocal way in the northern and southern hemispheres. Halfway in this recurring process are the equinoxes, a word meaning days of equal light and night. And at the endpoint of each increasing and decreasing half-year of light is a solstice. In this ancient, sun-oriented heliocentric or approach to time-keeping, the natural year technically begins at opposite times of the year in the northern and southern hemispheres. Depending on the year, the natural new year occurs on roughly December 21st in the north and June 21st in the south of our planet. Since most of us live in the north, and owing to frequent origins of annual time-keeping from the winter solstice, many of the world’s modern and pre-modern calendar systems begin (or once began) at the winter solstice in the northern hemisphere. Notable exceptions to this pattern are lunar calendar systems.